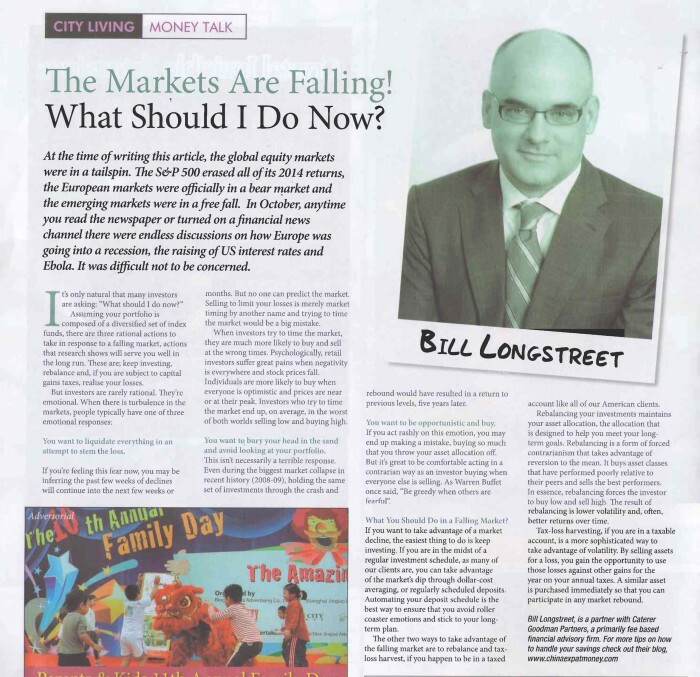 This article was first published on Talk Magazine Shanghai the 2014 November edition. At the time of writing this article, the global equity markets were in a tailspin. The S&P 500 erased all of its 2014 returns, the European markets were officially in a bear market and the emerging markets were in a free fall. In October, anytime you read the newspaper or turned on a financial news channel there were endless discussions on how Europe was going into a recession, the raising of US interest rates and Ebola. It was difficult not to be concerned. It’s only natural that many investors are asking: “What should I do now?” Assuming your portfolio is composed of a diversified set of index funds, there are three rational actions to take in response to a falling market, actions that research shows will serve you well in the long run. These are; keep investing, rebalance and, if you are subject to capital gains taxes, realise your losses. You want to liquidate everything in an attempt to stem the loss. If you’re feeling this fear now, you may be inferring the past few weeks of declines will continue into the next few weeks or months. But no one can predict the market. Selling to limit your losses is merely market timing by another name and trying to time the market would be a big mistake. When investors try to time the market, they are much more likely to buy and sell at the wrong times. Psychologically, retail investors suffer great pains when negativity is everywhere and stock prices fall. Individuals are more likely to buy when everyone is optimistic and prices are near or at their peak. Investors who try to time the market end up, on average, in the worst of both worlds selling low and buying high. You want to bury your head in the sand and avoid looking at your portfolio. previous levels, five years later. You want to be opportunistic and buy. If you act rashly on this emotion, you may end up making a mistake, buying so much that you throw your asset allocation off. But it’s great to be comfortable acting in a contrarian way as an investor buying when everyone else is selling. As Warren Buffet once said, “Be greedy when others are fearful”. What You Should Do in a Falling Market? If you want to take advantage of a market decline, the easiest thing to do is keep investing. If you are in the midst of a regular investment schedule, as many of our clients are, you can take advantage of the market’s dip through dollar-cost averaging, or regularly scheduled deposits. Automating your deposit schedule is the best way to ensure that you avoid roller coaster emotions and stick to your longterm plan. The other two ways to take advantage of the falling market are to rebalance and taxloss harvest, if you happen to be in a taxed account like all of our American clients. Rebalancing your investments maintains your asset allocation, the allocation that is designed to help you meet your long term goals. Rebalancing is a form of forced contrarianism that takes advantage of reversion to the mean. It buys asset classes that have performed poorly relative to their peers and sells the best performers. In essence, rebalancing forces the investor to buy low and sell high. The result of rebalancing is lower volatility and, often, better returns over time. Tax-loss harvesting, if you are in a taxable account, is a more sophisticated way to take advantage of volatility. By selling assets for a loss, you gain the opportunity to use those losses against other gains for the year on your annual taxes. A similar asset is purchased immediately so that you can participate in any market rebound.